As a society, we know that excess body weight is not good for our health. It increases the risk of an array of physical and mental health conditions such as hypertension, type II diabetes, coronary heart disease, stroke, osteoarthritis, depression, and anxiety. But what does obesity mean for your knees? Your knee is made up of three compartments: medial and lateral tibiofemoral joint (knee joint) and the patellofemoral joint (kneecap joint). 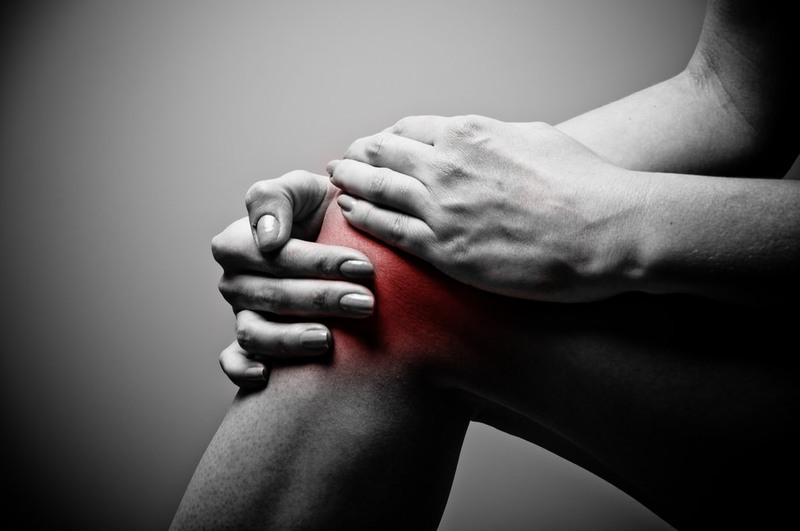 Knee osteoarthritis can occur in the tibiofemoral joint, the patellofemoral joint, or both. To date, many scientific studies have researched the link between excess body weight (commonly defined as body mass index, BMI) and development of knee osteoarthritis. It turns out that if you are overweight or obese, you are more likely to develop tibiofemoral osteoarthritis1. How does this happen? One proposed mechanism by which excess body weight could increase the risk of osteoarthritis is mechanical stress. This means as your body weight increases, so does the load on your knees. This additional load can cause you to walk differently, which in turn contributes to osteoarthritis. However, overweight or obese people are also more likely to develop osteoarthritis in non-weight bearing joints – for example, in the hand. Unless you do a lot of hand walking, mechanical stress alone cannot explain the link between excess weight and hand osteoarthritis. Another proposed mechanism by which excess body weight increases the risk of osteoarthritis is that excess body fat (adipose tissues) produces cytokines – cell signaling proteins – such as adipokines and interleukin. These cytokines can amplify the joint inflammation (e.g. synovitis) and this, in turn, could contribute to cartilage degradation. So we know there is an established link between excess body weight and tibiofemoral osteoarthritis…but what about your patellofemoral joint? We know that patellofemoral joint osteoarthritis is more common than previously thought – with patellofemoral osteoarthritis evident in one-half of the people with knee pain or knee joint osteoarthritis2. The patellofemoral joint plays a very important role in your knee function, especially during activities involving loaded bending movements of the knee such as squatting or going up and down stairs. During such activities your patellofemoral joint experiences a load equivalent to 2 to 3 times your body weight3. OK, what does this mean? Let’s suppose you weigh 70kg so when you are walking up the stairs your patellofemoral joints have 210kg of load going through them with each step. Now, let’s suppose you weigh 100kg, and now every step you take is subjecting your patellofemoral joint to 300kg of load. Keeping this example in mind, it is logical to assume that excess body weight could heighten your risk of developing patellofemoral joint osteoarthritis. Our research team wanted to shed some light on this topic. We systematically synthesized body weight data reported in scientific studies in people with either patellofemoral joint pain or osteoarthritis4. We found that people with patellofemoral joint pain weigh more, and people with patellofemoral joint osteoarthritis weigh even more, compared to people without pain or osteoarthritis. However, we also found that in people without patellofemoral pain, increased body weight did not predict future pain. This tells us that excess body weight may be a consequence rather than the cause of patellofemoral joint pain onset. We suspect that people with patellofemoral joint pain or osteoarthritis reduce their physical activity due to pain. Reduced physical activity could factor into weight gain in people with patellofemoral joint pain or osteoarthritis. Therefore, excess body weight could play a role in how osteoarthritis disease advances in people with patellofemoral joint pain and osteoarthritis. Although logical, there is very little scientific evidence to support or refute this. Scientists and clinicians in this field believe that patellofemoral joint osteoarthritis forms part of a continuum with patellofemoral joint pain5, one of the most common forms of knee pain in adolescents and adults. Therefore, addressing excess body weight in people with patellofemoral joint pain may limit the mechanical and metabolic consequences and may slow down worsening of patellofemoral joint pain and development of patellofemoral joint osteoarthritis. Clinically speaking, the results of our study suggest that clinicians should consider interventions for excess body weight, if appropriate when treating people with patellofemoral joint pain or osteoarthritis. Achieving or maintaining a healthy body weight could: (i) reduce patellofemoral joint loads that could be contributing to knee pain, (ii) reduce the risk of knee osteoarthritis (patellofemoral joint/knee joint osteoarthritis), and (iii) reduce the risk of additional co-morbidities (e.g. coronary heart disease, hypertension, stroke). So, maintaining a healthy weight could go a long way for your patellofemoral joint and general health6. Our research concludes that body weight matters when it comes to patellofemoral joint pain and osteoarthritis. As clinicians, it is important that we have conversations with our patients about body weight and its role in the development of osteoarthritis, as well as general health. We also need to move beyond the conversation and help patients to develop concrete weight management strategies, and to become part of their professional support network for achieving their personal goals. Dr. Harvi Hart is an Australian Endeavour Research Fellow at The University of Western Ontario. Dr. Kay Crossley is a physiotherapist and the Director of the La Trobe Sport and Exercise Medicine Research Centre and a BJSM Editor. Zheng H, Chen C. Body mass index and risk of knee osteoarthritis: systematic review and meta-analysis of prospective studies. BMJ Open 2015; 5: e007568. Hart HF, Stefanik JJ, Wyndow N, Machotka Z, Crossley KM. The prevalence of radiographic and MRI-defined patellofemoral osteoarthritis and structural pathology: a systematic review and meta-analysis. Br J Sports Med 2017; 51: 1195-1208. Trepczynski A, Kutzner I, Kornaropoulos E, Taylor WR, Duda GN, Bergmann G, et al. Patellofemoral joint contact forces during activities with high knee flexion. J Orthop Res 2012; 30: 408-415. Hart HF, Barton CJ, Khan KM, Riel H, Crossley KM. Is body mass index associated with patellofemoral pain and patellofemoral osteoarthritis? A systematic review and meta-regression and analysis. Br J Sports Med 2017; 51: 781-790. Thomas MJ, Wood L, Selfe J, Peat G. Anterior knee pain in younger adults as a precursor to subsequent patellofemoral osteoarthritis: a systematic review. BMC Musculoskelet Disord 2010; 11: 201. Gersing AS, Schwaiger BJ, Nevitt MC, Joseph GB, Chanchek N, Guimaraes JB, et al. Is Weight Loss Associated with Less Progression of Changes in Knee Articular Cartilage among Obese and Overweight Patients as Assessed with MR Imaging over 48 Months? Data from the Osteoarthritis Initiative. Radiology 2017; 284: 508-520.